I was proud and excited to be among the honorees at this year’s Celebrate Architecure. As a newly announced Fellow of the American Institute of Architects, my classmates and I were recognized during the event. Highlighted by the tribute to the late, great Bryce Wiegand, FAIA, there were so many memories or architectural practice in Dallas over the past 40 years and so many memories invoked of people, firms and events. It was a special evening. 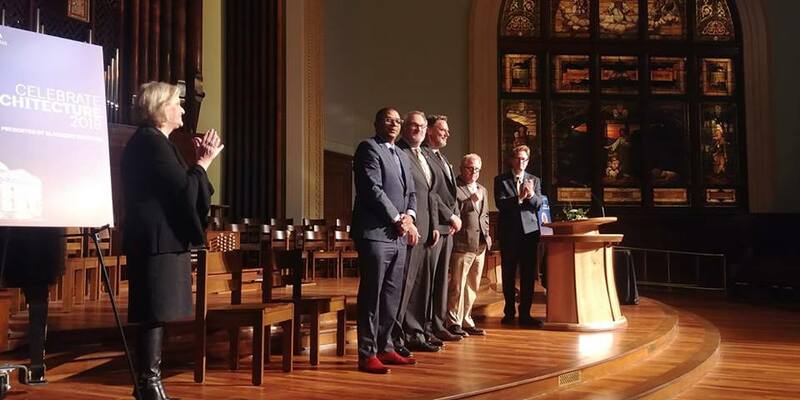 Plus, I love that AIA Dallas recognized David Preziosi of Preservation Dallas, Heritage Oak Cliff and held the event in the historic First Presbyterian Church in Downtown and the reception in the beautiful Carlisle Room in the historic Lone Star Gas Lofts. Historic Preservation was well-represented that evening. A very encouraging sign. The new AIA Fellows; Darren James, FAIA, Jeff Gunning, FAIA, Bob Bullis, FAIA, Peter Brown, FAIA (not pictured) and Norman Alston, FAIA. For the past 30 years, Norman Alston Architects has shown the possibilities that are available when important historic buildings and sites are thoughtfully preserved and equipped for modern, productive use. The firm has completed successful, award-winning restorations, renovations, and additions by demonstrating that preservation is economically advantageous, environmentally responsible and culturally invigorating. Our projects are often catalysts for redevelopment of the surrounding community. Successful projects range from important large structures in large urban areas to numerous small projects in rural communities where professional skills in historic preservation are often assumed to be unavailable.